Hi, I am interested in your 1978 Pontiac Firebird (stock #4702-ATL) listed on Autotrader for $44,995. I'd like to get more information about this vehicle and confirm its availability. As the 70s progressed, the muscle car was becoming a backburner item for several manufacturers, with both wheelbases and engines getting continually smaller as the result of the gas crisis. But Pontiac was having none of that. Aesthetically speaking, they doubled down on their coveted Firebird, equipping it with a high impact appearance and offering the option to fill its engine compartment with a sizable big block. 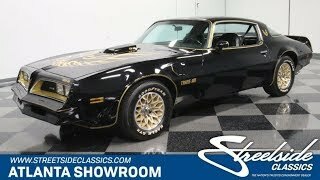 This 1978 Pontiac Firebird Trans Am ably captures the model at its best during that defiant time - its as turnkey as can be and comes with both a factory build sheet and PHS documentation to vouch for its authenticity. Theres nothing subdued about this one. Its an absolute attention magnet, dressed out in black thats ornamented with a terrific combination of gold pinstriping and badges. On its scooped hood sits what is likely the most instantly recognizable decal ever to emerge from a Detroit assembly line - an expansive namesake Firebird that stretches nearly fender to fender. From front to back, the car retains its stock configuration - it actually began life with this decidedly aftermarket-looking color scheme, which will reach its full potential with a detailing session. The array of gold accents is in particularly good form here as all decals, stripes and badging show consistent coloring and sharp edges against their clean black backdrop. This 78 retains its original road hugging stance, sitting nice and low over its wheels for a great center of gravity. If youre looking to make a big entrance, this Pontiac certainly has you covered. <BR. Open one of the doors and youll see a black vinyl interior thats been meticulously restored to factory specs, with the pair of high backed buckets straddling a very clean center console. There are no signs of excess wear inside this cabin, every surface seems like its been treated with respect and the fact that this Pontiac has actually logged very few miles since its restoration has left everything in great shape. The dash area features a sharp looking gold accent surrounding its instrument panel, with a machine-turned texture thats a visual precursor to the carbon fiber look we see so often today and a full complement of factory-style gauges on hand that all work as intended. Youll find a full spare at the ready in the trunk, and a fresh-appearing rubber seal sits under the deck lid to keep the elements from intruding. Comfort and convenience features include air conditioning, a tilt column, power windows, a rear window defogger and an AM/FM/8-track stereo that redefines the term period appropriate . Raise that storied hood and youll find a 455 cubic inch V8 waiting underneath, matching the displacement of the largest powerplant offering when this 78 went into service. It sits in a very nicely detailed engine compartment and wears a 4-barrel carb on top and pairs with a 3-speed TH350 automatic transmission. Both the engine and transmission were rebuilt not long ago, so this is a drivetrain thats functioning at its best, while the 3.23 gears in back offer a nice balance of off the line acceleration and reasonably low RPMs at highway speeds. Power steering makes this classic easy to navigate, while power brakes - with discs up front- equip it with fade resistant stopping ability as it turns heads on its set of 15 gold Trans Am wheels outfitted with Goodyear Eagle GT II tires. Below, the undercarriage looks very solid. This 1978 Pontiac Firebird Trans Am represents one of the most iconic models in great form - its been skillfully restored both inside and out and stands ready to provide many future miles of enjoyment. Call today!